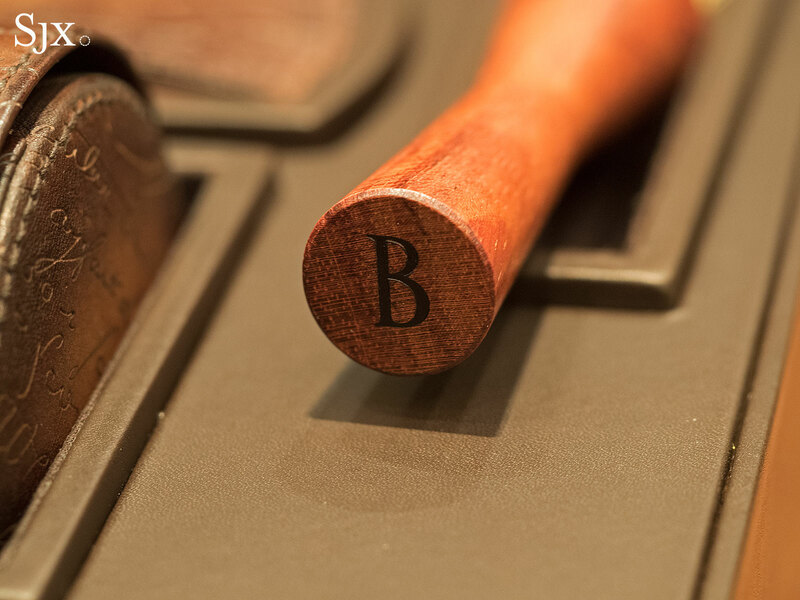 Berluti's famous calligraphy covered Scritto leather is used for the dial and strap of Hublot's latest wristwatch, which comes inside an enormous Berluti leather box. Eminent fashion and leather goods houses have spent millions of dollars building factories (like Louis Vuitton’s shiny new building in Geneva) to make respectable mechanical watches. 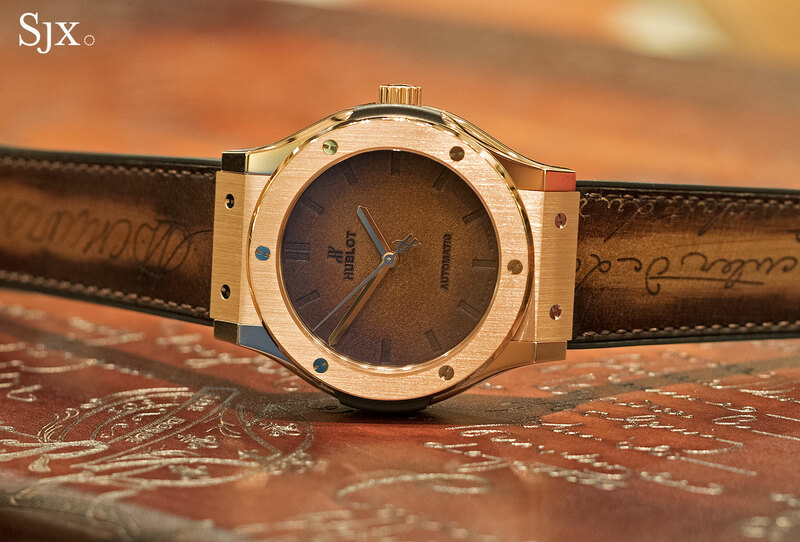 Hublot, in contrast, has wrapped its latest wristwatch in lots of patinated leather from Berluti, the Parisian shoemaker famous for its strikingly patinated leather. 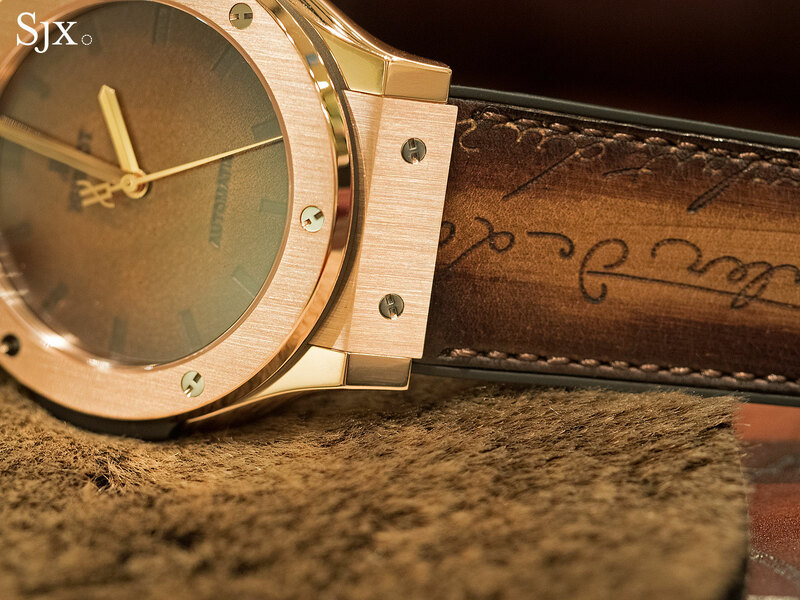 Hublot’s collaboration with Berluti – both are sister companies in French conglomerate LVMH – has produced a pair of elaborately packaged limited editions that made their debut at Baselworld 2016. 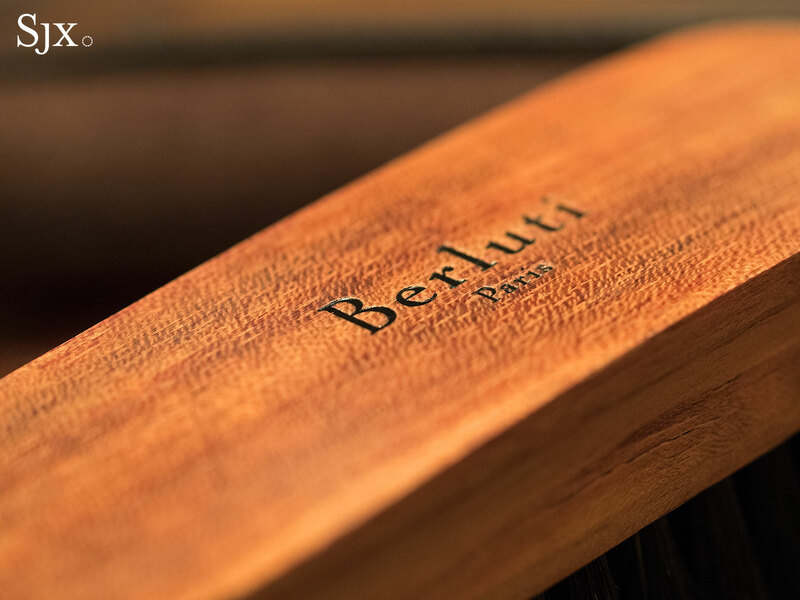 The better looking, albeit pricier, of the two is the Classic Fusion Berluti Script that uses Berluti’s signature Venezia leather. 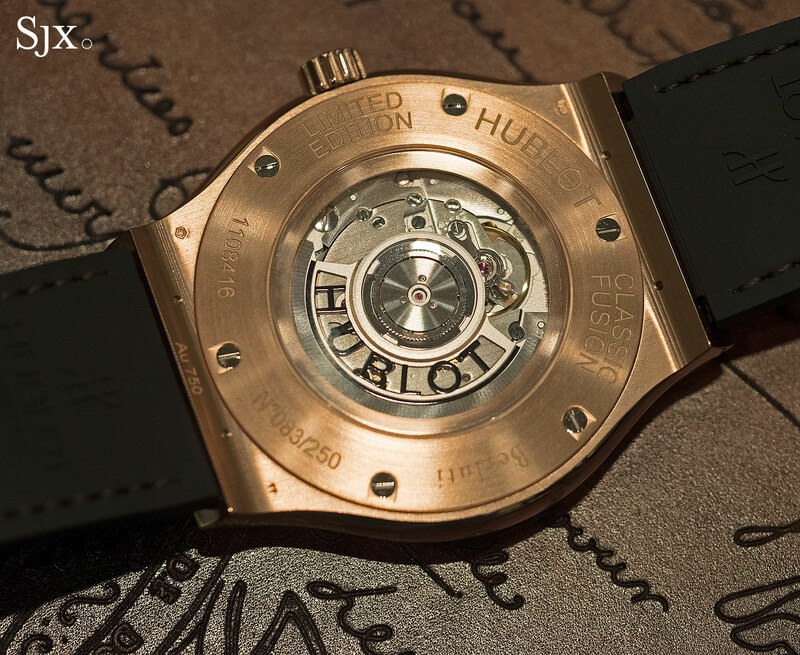 The watch itself is an ordinary Hublot Classic Fusion, with a 41mm case in 18k King Gold that has an basic ETA 2892 automatic inside. 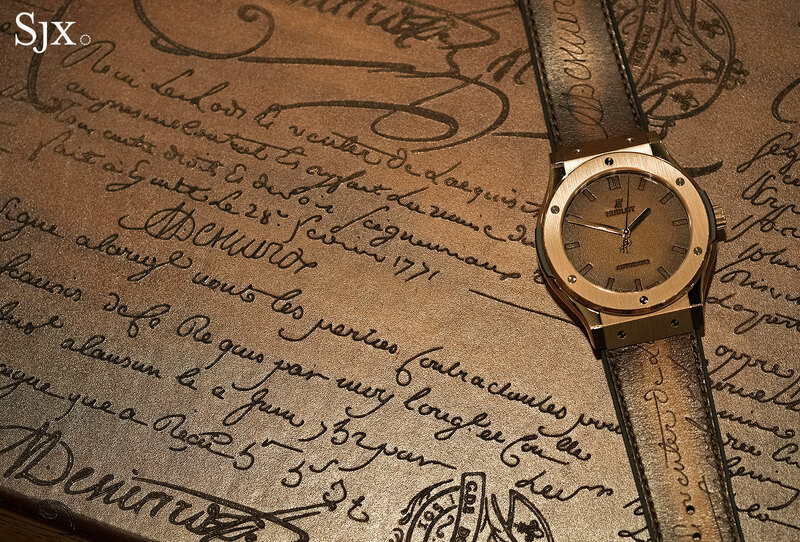 Instead of a conventional face, the dial is made of leather with the hour markers and lettering embossed. 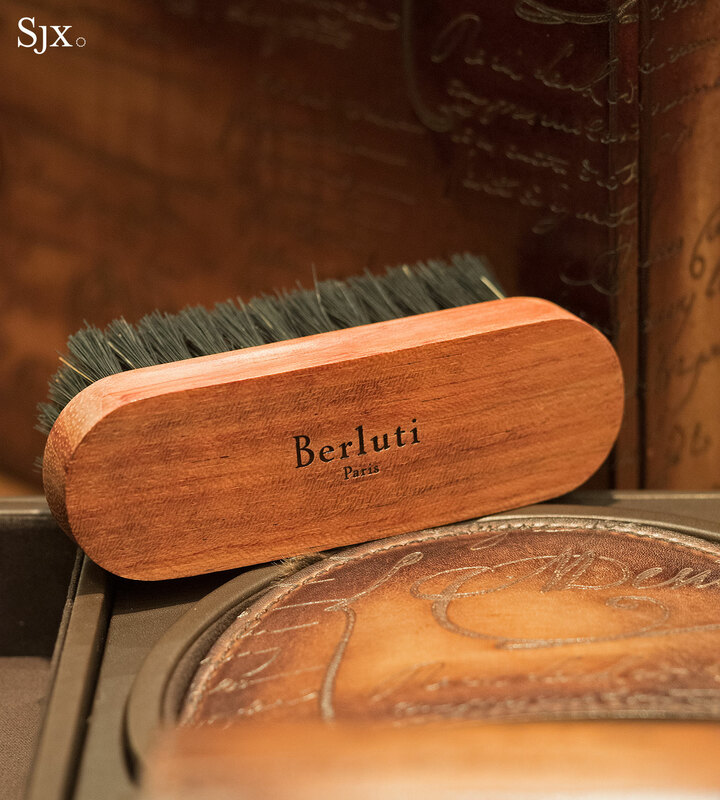 The leather covering of the rubber strap matches the colour of the dial, with the engraved calligraphy characteristic of Berluti’s Scritto leather. The strap leather, however, does not quite match the leather on everything else. Besides having a slightly different texture, the colour of the strap is not quite as rich, and the patina is not as nuanced. 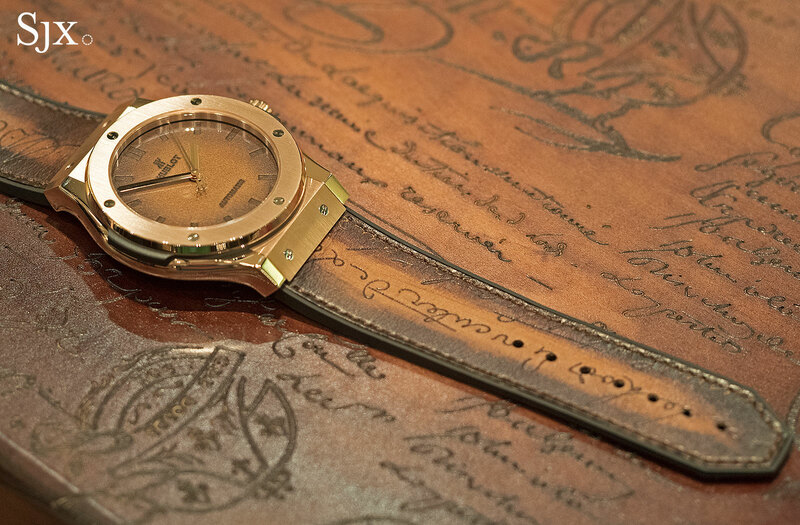 Possibly the thinness of the strap leather dictated a different leather. Everything else, however, is beautifully coloured and impressive to behold. 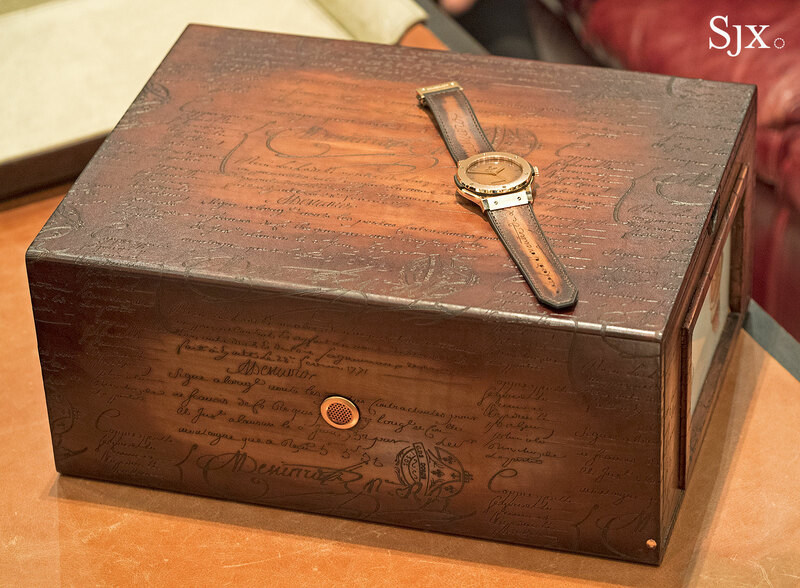 The watch is packaged in a large box covered on all sides in Venezia Scritto leather in tobacco bis, a rich brown-gold-orange shade plastered with laser-engraved calligraphy – a look that is flashy and appealing. 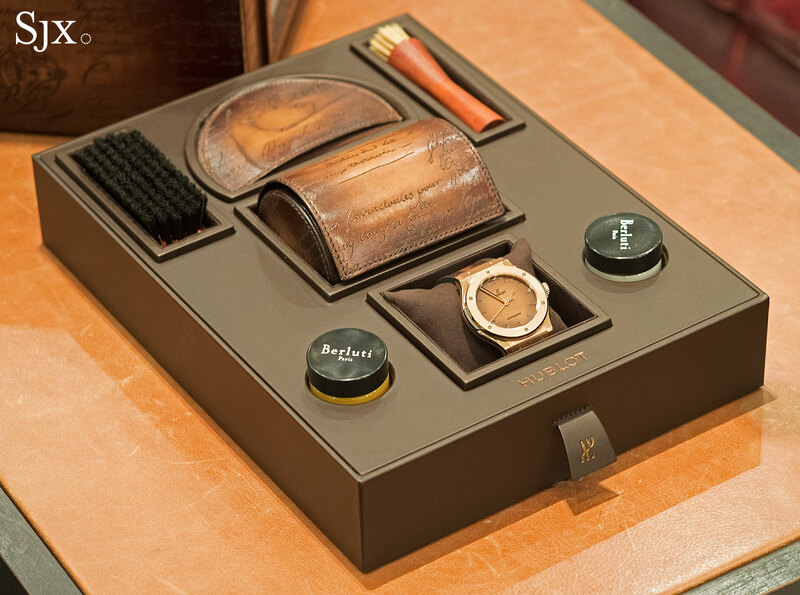 Slide out the tray inside the elaborate box and all the accessories are displayed in their full glory. 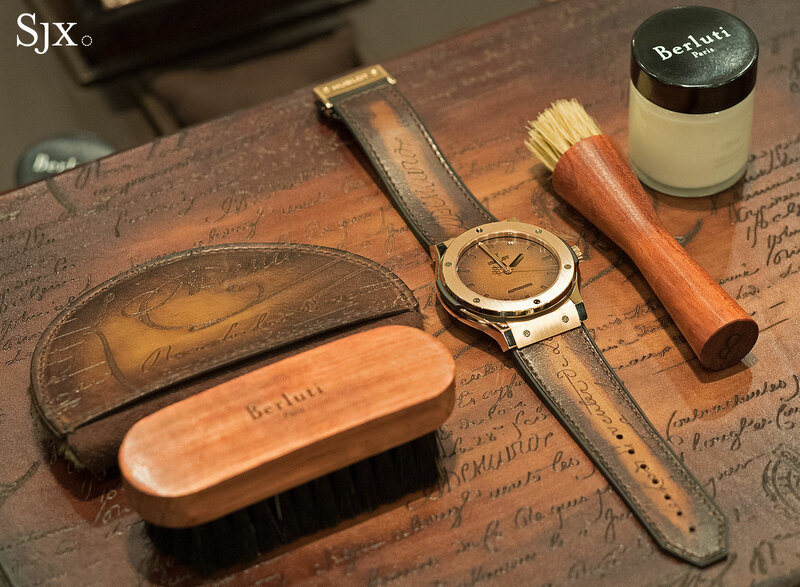 The package includes a shoe polish and shoe cream (both Saphir Médaille d’Or – probably the most expensive shoe care product in the world), as well as a horsehair buffing brush, cleaning brush, a leather-covered polishing glove. 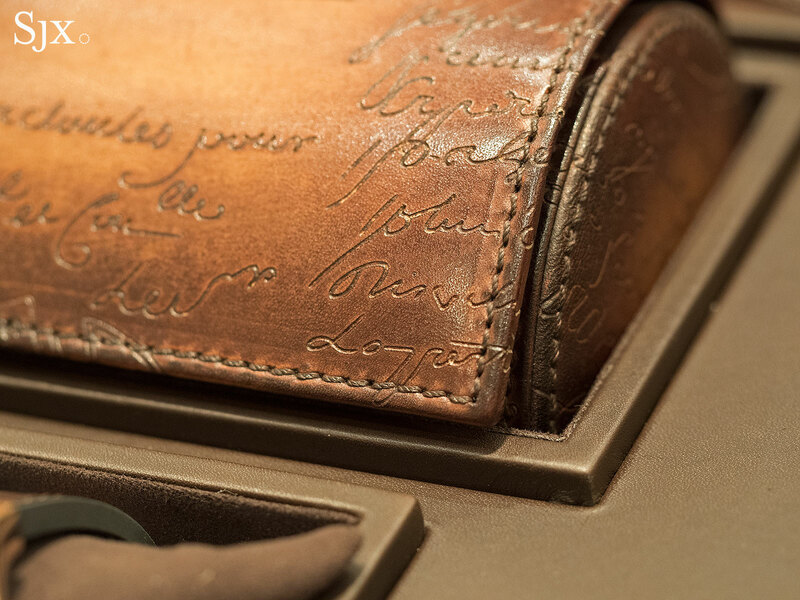 The only bit that is useful for the watch is a tubular pouch for a single watch, covered in the same Scritto leather. Taken together the package doesn’t really make sense – in fact its intellectual foundations are exceptionally shaky – but the whole thing looks wonderful inside the box. All of the neatly arranged accessories do evoke memories of a child’s toy set, but aren’t luxury watches toys for boys? 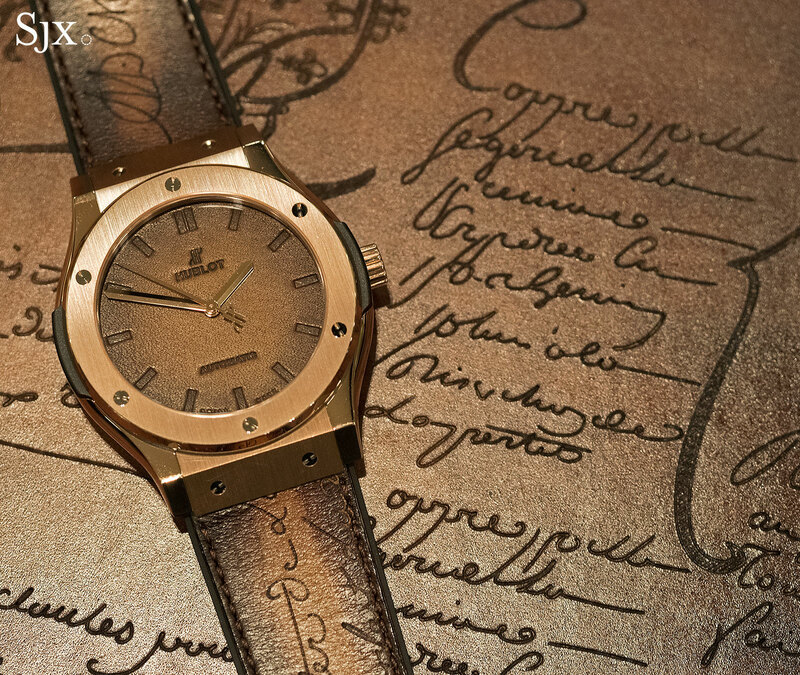 The Classic Fusion Berluti Scritto is a limited edition of 250 pieces, with a stiff price tag of US$29,400 or S$46,800. It’s also available in ceramic and titanium as the Classic Fusion Berluti All Black that costs US$14,600 or S$23,400. 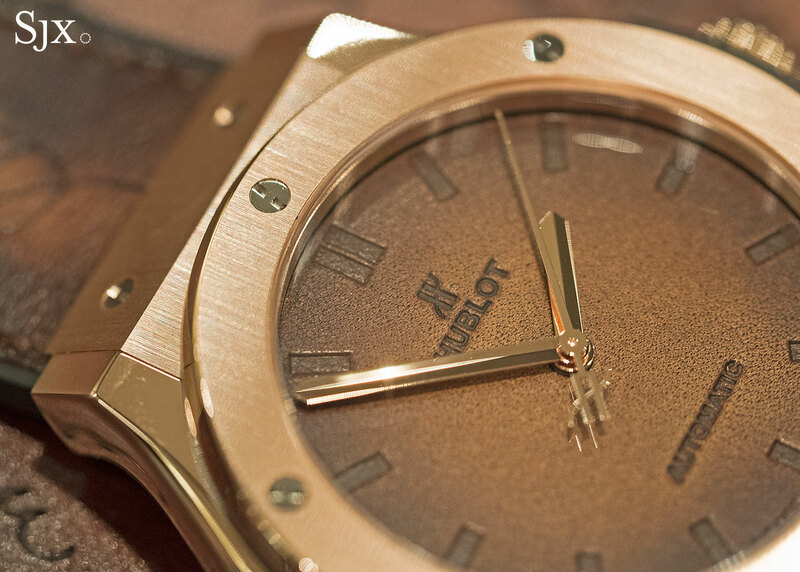 Both are already available at Hublot retailers and boutiques. 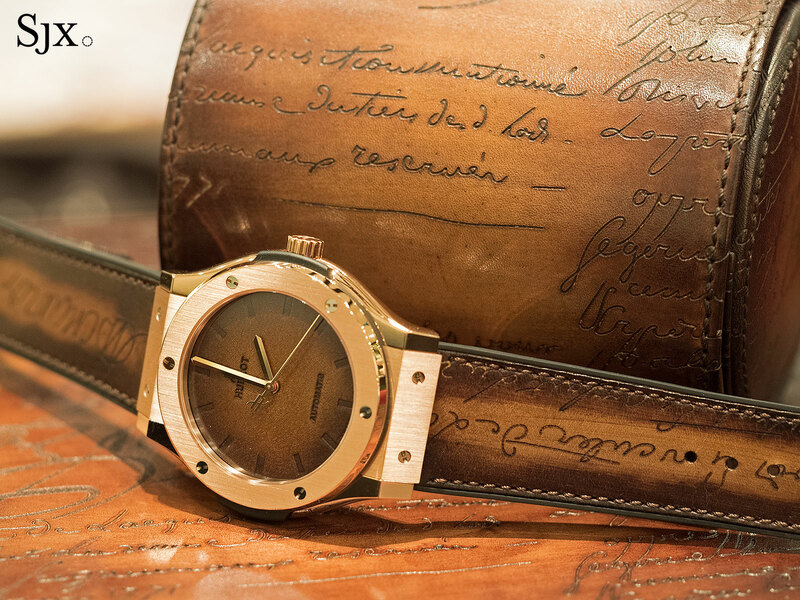 Hublot has recruited the Berluti to create the Classic Fusion Berluti, with the dial and strap made of the shoemaker's signature patinated leather. Read on for details, including official pricing.